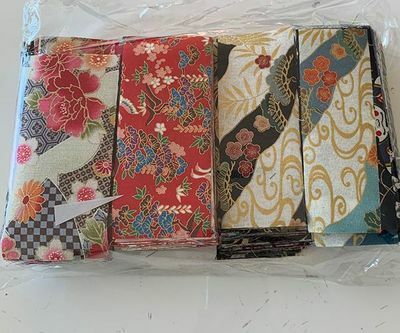 1 lb Packet of Asian Scrap Pieces. Each scrap packet has approximately 1 pound of assorted scraps in varying sizes. Pieces generally range in size from about 1 1/2 - 2" x 5". The bag contains a mixture of Asian prints in a wide range of colors. Multiple duplicates are included. Fabrics are stacked and not creased or folded. At least 3 out of the 4 edges are even straight cuts. One pound is about 3-3 1/2 yards of total fabric. This item must be ordered separately due to it's bulkiness.